How to create and save filters? Filters are the tabs that you will notice that on the top of the table. These tabs are the filters that the system will create by default. Click on the “Filter” button, highlighted in orange in the picture below. 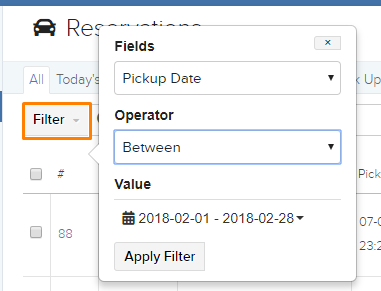 Select how you would like to filter the table with any of the 3 combinations of “Fields”, “Operator”, and “Value” and click on the “Apply Filter” button. Once you have gotten your desired list, click on the “Save this Search” button, highlighted in orange in the picture below. Once you click the button, a new window will appear. Type in your desired filter name in the text box. Here is where you also select the configuration for the filter. Click on the blue “Save” button to save the filter. If you have done these steps correctly, you will notice an extra tab on the top of the table like in the picture below. How to delete a saved filter? 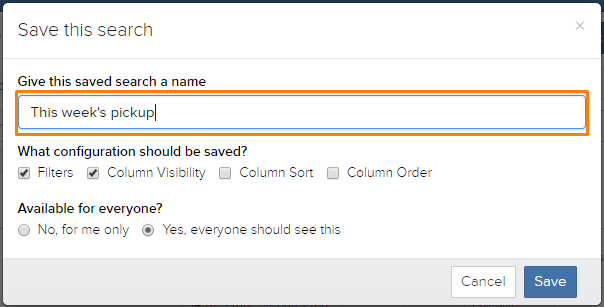 To delete a saved filter, click on the saved filter. You will notice an “x” on the right side of the filter name. Click on that “x” button to delete the filter.